Cleravo® is a Clearfield herbicide, designed to work directly with Clearfield varieties, which have been traditionally bred to tolerate the active ingredient, imazamox. Cleravo is applied post emergence of the crop, offering flexibility at a busy time of year. It offers consistent control of ‘problem’ brassica weeds such as charlock, runch and hedge mustard, along with volunteer OSR, volunteer cereals and a wide spectrum of broad-leaf weeds. Cleravo® can be used as a one-shot option at post-emergence timing. However, where there is a high population of early weeds that can get big quickly, such as crane’s-bill or poppy, metazachlor-free Cleravo®, also allows for an early application of metazachlor to sensitize these weeds. Clearfield® is a unique system, offering unique benefits. Clearfield® herbicides have been formulated to work solely with Clearfield® varieties. 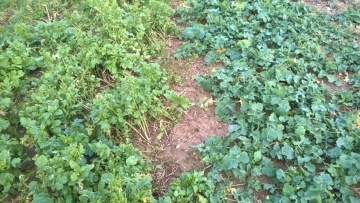 The hybrid vigour and SU tolerance helps the crop get off to a rapid start and minimizes establishment risk, whilst the broad-spectrum weed control offered by Cleravo and Cleranda, delivers effective control of brassica weeds, volunteer OSR, volunteer cereals and the widest range of broad-leaf weeds. Overall, the system provides greater confidence, flexibility and control over your OSR crops. In field trials, Cleravo® and Dash® HC provided excellent control for a wide range of weeds. Common weeds such as cleavers, mayweed and chickweed were all susceptible to Cleravo®, along with more difficult to control brassica weeds such as charlock. With any good outcome, you have to start right. So when developing a solution to OSR’s notorious unpredictability, that’s exactly where we began – the seed. Hybrid varieties of OSR were developed that work directly with the Clearfield® herbicides. Flexible, fast establishing and effective against the widest range of weeds, it’s a system that’s produced some remarkable results. A Clearfield® herbicide containing imazamox and metazachlor that delivers impressive post-emergence weed control, including Charlock, Hedge Mustard and Runch, as well as broad-spectrum, broad-leaf weed control, volunteer OSR and volunteer cereals. Dash® HC is a non-ionic surfactant which improves leaf cover and uptake. Dash® HC should always be applied at 1.0 litres per hectare with any Cleravo® application.